PNKA (Indonesian State Railways) DD52 Class 2-8-8-0 Mallet No. DD52 03 works a mixed goods train from Tjibatu to Tasikmalaja, approaching Tjipeundeuj in the mountains of south western Java on the afternoon of Thursday 19th July 1973. This engine was built by Hanomag in Germany in 1923. Slide No. 11311. Reminds me of some shots taken by well known railway photographer Colin Garrett. 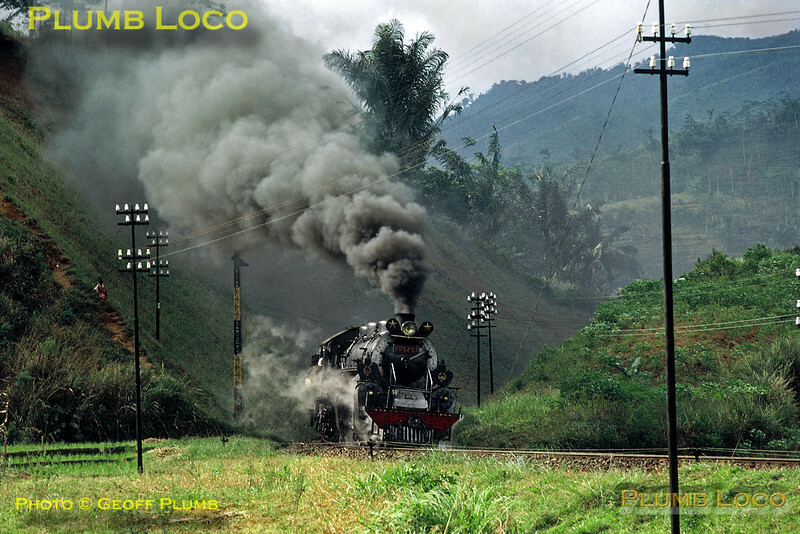 really sad looking indonesian giant locomotive in action, there are was scraped and destroyed in early 1980's, no one from them can't see same with CC10 class. the giant in indonesia who can see until now just CC5001, and CC5029 in one piece, CC5030 you can see only his face. thanks for your so much.